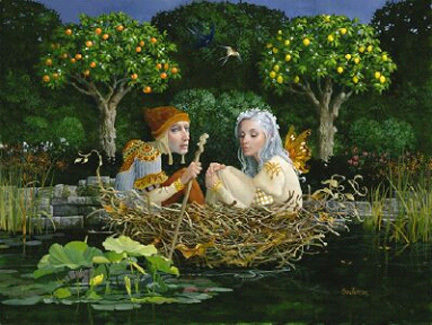 "On the great river of life, our relationships act as boats, keeping us together as we travel along," says artist James Christensen. "Unlike real boats, however, these metaphorical vessels grow sturdier with time. A new marriage is like a tiny nest of sticks and twigs, barely large enough for its inhabitants. As time goes on, the couple will build supports and shelter into their boat, until eventually it will be able to withstand even the fiercest storm. The flora and fauna in the background are all traditional symbols of happy marriage."